Based in the hustle and bustle of New York City's Manhattan district, the Museum of Arts and Design is a unique and fun art museum that displays an assortment of handmade objects preserved through a range of mediums. It's certainly a unique New York City attraction with programs and exhibits that cover everything from furniture to perfume and even industrial design. Having a Museum of Arts and Design voucher is great if you want to visit a unique attraction that the whole family will love without spending a lot. Different times of the year will bring about a variety of exhibitions for families to visit, so a little research beforehand may be in order. Past exhibitions that have proved popular include 'Out of Hand', a look into how technology has shaped creativity and artistic expression in today's society while 'The Art of Scent' focuses on scent as a medium. There are a wide range of options in exhibits within the museum, ensuring there's a little something for everyone to read about, see and learn at the same time. The Museum is open most days with the exception of bank holidays and Mondays. Admission is certainly affordable. It's free for children ages 18 and under, and just $16 for adults, special tour bookings are also available for groups and discount vouchers are often available. Guided gallery tours are an excellent way to make sense of the exhibits on show and school-groups are even given their own 90-minute program. There are Open Artist Studios too, with limited opening hours, which offer a different insight into what goes on within the museum and the process behind the art. Visitors and families have a choice when they step through the front doors of the museum. A number of programs are available to delve into, from workshops to talks. While a younger audience may not find these as stimulating, the museum also offers a number of cinematic shows, using the cinema to immerse the audience. There is the Encounters section which children will enjoy. This is a far more interactive program which includes artists creating an assortment of edible sculptures from sweets and children's treats. Unique, interesting and educational; these words best describe the Museum of Arts and Design, and parents will find it very accessible with plenty to see and do. Not only are kids catered to, but an older generation will find plenty of interest as well and will be safe in the knowledge that their kids are developing a taste for culture at the same time. That sounds like an amazing place to spend a day! My kids would love it. I have always wanted to go here. It's on my list of places to stop if I ever get to take the kids to NYC. I hope to someday get to explore places like this in Manhattan! This would be great for my kiddos! This looks like a wonderful place to visit and take the kids! I would love to go there! Museums are great because quite a few of them are free with donation only and they are super educational which as a homeschool mom I love! We frequently visit NYC but I haven't been to Museum of Arts and Design. Now that I know that it's family friendly, I might consider taking a trip there! I have got to get to NYC. I've never been to the Museum of Arts and Design, but it looks and sounds like an awesome place to visit with kids. Finding a family friendly place in NYC is not always easy! Thanks for the tip! 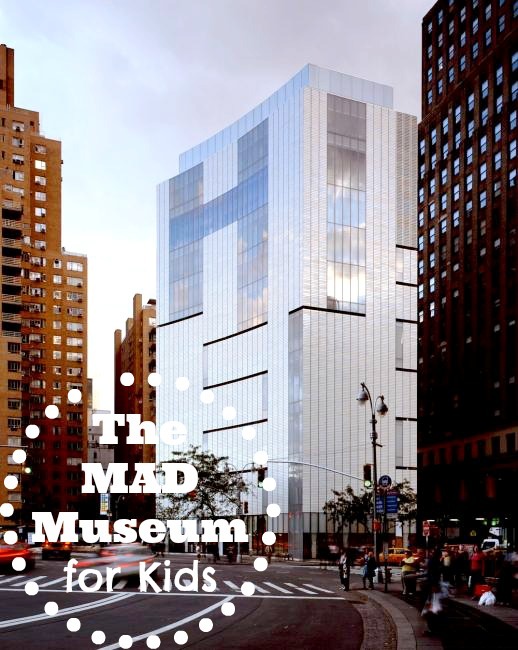 Thanks for sharing these tips, so we can start planning our trip to MAD Museum. My daughter loves museums! This one sounds fun! How could I have missed this museum?! Will definitely visit next time I'm back in New York. This is one I didn't know about. It sounds fascinating and totally worth a visit! This sounds like a great museum to visit. My kids would be instantly won over by the edible sculptures! I like that there are so many choice. I like that there's a cinema too, that's great for encompassing a lot of ages (interest-wise). I'm not too far from NY. I'll have to put this on my list of things to do next time we're up that way. We are a museum family! Thanks for the heads up on this. Museums are a great place for kids because they are fun and educational at the same time. I love visiting museums. I would go to them every year when we lived in NY. I haven't been to one here in CO as yet but I plan to. My kids would love to go to this museum!